The adult human skeleton consists of more than 200 separate bones (often around 206 individual elements) whilst the juvenile skeleton can have over 300 individual elements (predominately in newborn babies) (White & Folkens 2005). Over time certain bones fuse to others (such as the os coxa or hip bone) to produce stable and protective environments once the soft tissues and the body have fully grown (i.e. the plates of the cranium once the brain has fully grown into it’s adult form). This occurs in two main stages in the life of a human: during the early years of infancy and a second growth spurt during adolescence. In life the skeleton can weight from between 12% to 20% of an individual persons weight. 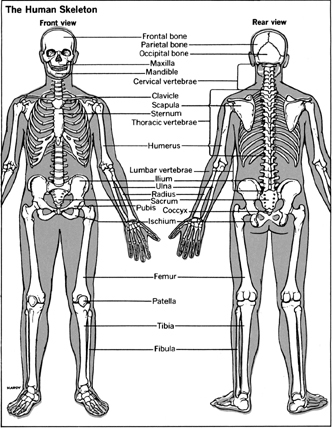 Please click on the below picture to enlarge the diagram of the general skeletal elements found in the human skeleton. 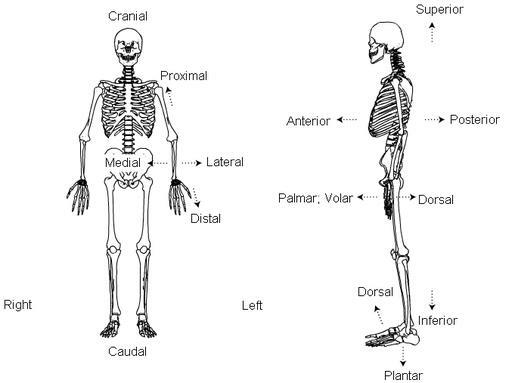 Basic skeletal elements of Homo sapiens (humans). The skeleton, and individual bones, act as both tissue and as organs (White & Folkens 2005). Primarily the skeleton acts as a mechanical component for the musculo-skeletal system to allow movement of the body. The skeleton provides a framework for organ protection and support for the body by helping to anchor muscles, tendons and ligaments; movement is achieved by the bones acting as rigid levers for the muscles to help produce movement (White & Folkens 2005: 31). Important physiological functions of bone include the production of blood cells; bone can also acts as a storage for calcium and fatty deposits. Traditionally skeletal elements are classed around 4 main groups which are typically broken down into long bones (femur, tibia etc), short bones (carpals etc), flat bones (scapular etc) and irregular bones (Os coxae). Bone is mainly consisted of a composite material of Hydroxyapatite (a mineral) and Collagen (a protein). It is amongst the strongest of biological materials: able to cope with a variety of high mechanical stress levels including bending and contortion pressures (White & Folkens 2005). The basic structure of living bone is provided below. 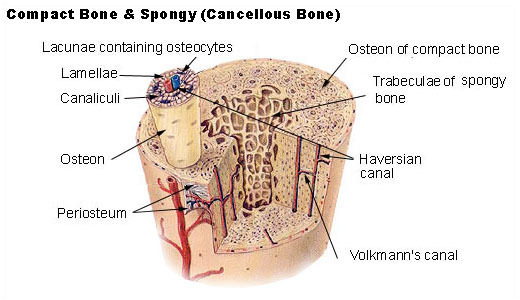 On the outer surface of the bone is a membrane called the Periosteum in which blood vessels and nerves pass whilst the outer bone surface itself is called Cortical bone (otherwise known as compact bone) and the the inner bone is called Trabecular bone (otherwise known as spongy bone, a good shock absorber) (Mays 1999). In the long bones especially a Medullary Cavity is often present where fat cells can be stored and blood is produced in red marrow (Schwartz 2007). 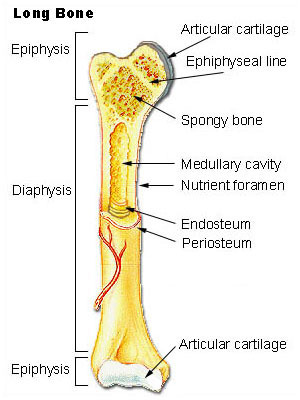 The basic anatomy of bone highlighting the diaphysis (shaft of bones) and epiphysis (ends of bones) with the periosteum membrane and medullary cavity highlighted (Source: Wikipedia). The growth of bones in the womb and up until full maturity is directed by two different biological processes. Endochondral Ossification is a process by which bones are preceded by cartilaginous models. Ossification in this case is initiated before the birth of the individual in the mother’s womb. Endochondral bone growth is the primary process of bone ossification in the human skeleton (White & Folkens 2005). Intramembranous Ossification occurs when apposition of tissue within an embryonic connective tissue membrane covering takes place. However this method of bone ossification is largely limited to the cranial vault of the human skeleton, primarily the frontal and parietal bones (White & Folkens 2005: 46). 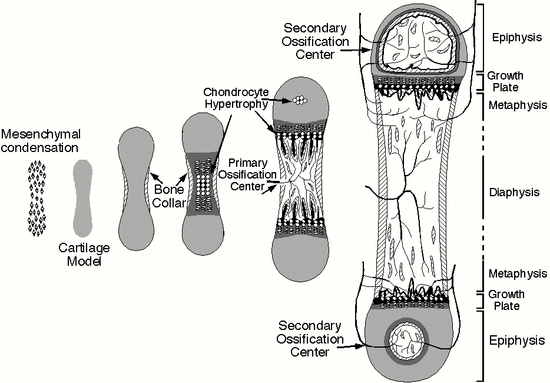 Generalized bone growth highlighting the importance of the main ossification centers of bone. Many bones have one or two primary ossification centers but some have more, depending on the location and shape of the bone. The growth plates (epiphysis), located at the end of the diaphysis, highlight how the individual bones can grow until full fusion of the individual elements occurs when growth stops, which is usually during late adolescence (Source: Baron 2008). Fusion of the epiphysis plates to the diaphysis plates mainly occurs in the long bones of the skeleton ( the femora, tibiae, humeri etc) during late adolescence. It is often used as an age estimator when describing archaeological skeletal material (Mays 1999) as individual elements fuse as different times. This is the reasons why human juveniles have a greater number of individual skeletal elements compared to the fully mature skeleton of adult individuals. Anatomical directional terms and planes of reference are used to give precise locations when discussing the human skeleton. This is so that when using this nomenclature it is obvious to all concerned about what is being talked about; it is used to avoid ambiguity. Below is a diagram outlining the main terms. 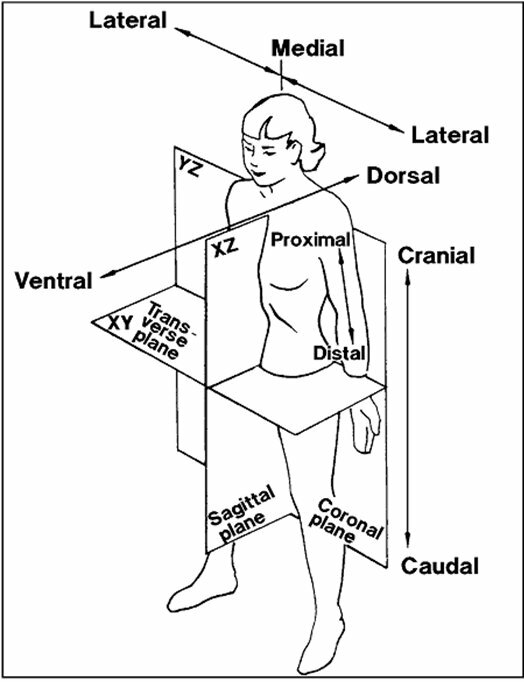 Standard anatomical directions used in human anatomy for orientation of elements. The skeleton is often described of as composing of the appendicular and the axial skeleton. The appendicular skeleton (126 individual bones) is the locomotor of the body. The appendicular skeleton includes the elements and joints of the feet, leg and hip bones together with the hand, arm and shoulder bones. This allows an astonishing array of large and fine movement and functions, although more rotation and general movement is permissible at the shoulder joint because of its structure in comparison to the weight bearing hip and knee joints (Schwartz 2007). The axial skeleton (composed of 80 individual elements) holds the pelvic girdle, the ribcage, the shoulder girdle and the cranium. The axial skeleton houses all of the main organs of the body and supports the basic biological function of life as we know it. Osteocytes: Osteocytes are relatively long lived inert bone cells, they can however perform a function similiar to osteoblasts, but their primary hypothesized role is to monitor the activity of osteoblasts and osteoclasts inside a basic multicellular unit. Osteoblasts: Osteoblasts synthesize the production of bone when grouped together as an osteon. Osteoclasts: osteoclasts re-absorb bone tissues, a vital process during the maintenance and repairing of healthy bone. In living persons the bone is covered by the periosteum, a living tissues that acts as a soft tissues from which vessels bringing in and out blood etc moves through (White & Folkens 2005). Here is a guide depicting variation between human and various animal microstructure, and how to recognise the variations when studying comparative osteology and zooarchaeology. Bone microstructure in a hypothetical and typical transverse slice of bone. Not to relational sizes (Source: Wikpedia). A full list of terms and directions are described here. As we are in the business of archaeology, the condition and quality of the bone found in such circumstances is dependent on two main processes post burial/depositional, which are Diagenesis and Taphonomic changes. Diagenesis “is the cumulative physical, chemical and biological environment; these processes will modify an organic object’s original chemical and/or structural properties and will govern its ultimate fate, in terms of preservation or destruction” (Wikipedia 2011). Taphonomy is the study of decaying and decayed organisms. Thus the “study (of) taphonomic processes(can be used) to determine how plant and animal (as well as human) remains accumulate and differentially preserve within archaeological sites. This is critical to determining whether these remains are associated with human activity. In addition, taphonomic processes may alter biological remains after they are deposited at a site.” (Wikipedia 2011). A discussion of tooth anatomy will follow in the next week or so, as teeth are a distinct part of our skeletal body. Various elements of the skeleton, i.e. the vertebral column, will be discussed in separate posts for a more in depth study. For the moment it is important to grasp the fundamentals. Terminology regarding subject key words (terms such as ‘Bioarchaeology’ or ‘Physical Anthropology’) will be discussed in the following post to decide what exactly they mean, and where they came from. Hopefully this short series of introduction posts will help broaden your knowledge of human osteology as it is practiced at the current time. Please head over to Powered By Osteons blog to learn about the microbiology of bone, including how Osteoblasts and Osteoclasts work.